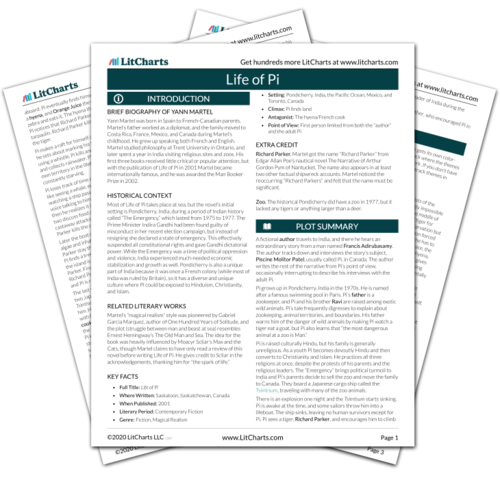 Instant downloads of all 946 LitChart PDFs (including Life of Pi). 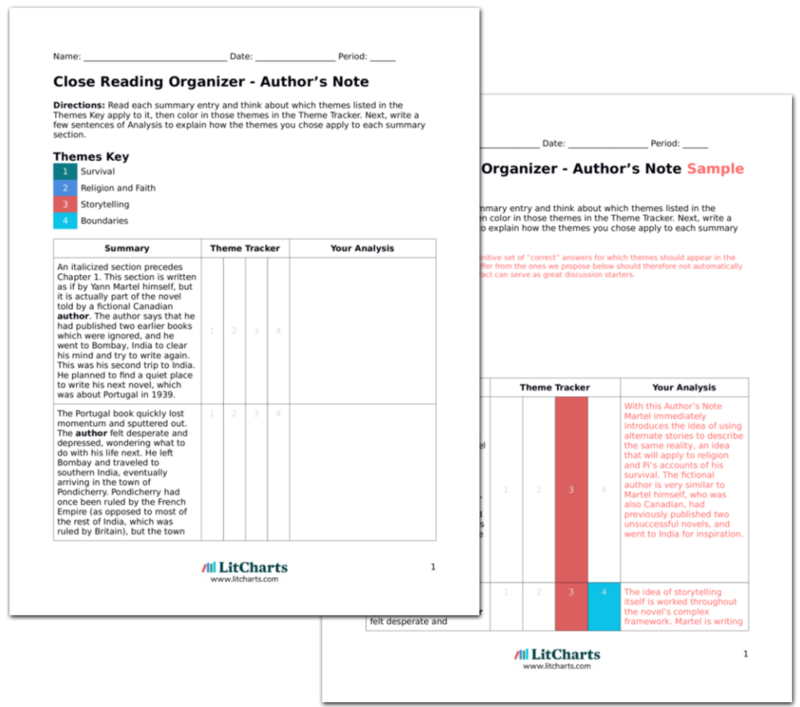 LitCharts assigns a color and icon to each theme in Life of Pi, which you can use to track the themes throughout the work. Pi reads the survival manual that he found in the locker. It advises him about what kinds of fish not to eat, to not drink urine, and that the horizon, when seen from near sea level, is only two and a half miles away. After reading it Pi resolves to continue with Richard Parker’s training regimen, to improve the raft, to build himself a shelter, and to stop hoping for rescue. He realizes that he is totally alone, and he weeps. Pi now has work to keep him busy, which is his greatest defense against despair and loneliness. Pi decides to stop hoping to be rescued, as watching the horizon is just a waste of time and energy. He doesn’t know that he will soon be desperate enough to want to drink urine. Cosby, Matt. "Life of Pi Chapter 58." LitCharts. LitCharts LLC, 24 Jul 2014. Web. 25 Apr 2019. Cosby, Matt. "Life of Pi Chapter 58." LitCharts LLC, July 24, 2014. Retrieved April 25, 2019. https://www.litcharts.com/lit/life-of-pi/chapter-58.